Ever since the Dutch settled in South Africa back in the 17th century, bringing French Muscadet grapes with them, the country has been making fine wines that benefit from the region’s hot, coastal climate. 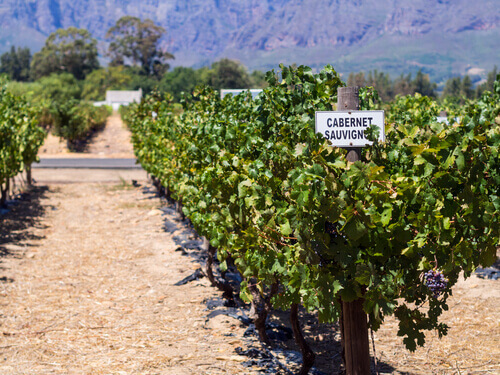 South Africa has now become one of the top ten wine producers in the world and Route 62 – running 850 km along the coast from Cape Town to Port Elizabeth – is arguably the longest wine trail in the world. It’s also among the most scenic. Not only has South Africa raised its game when it comes to wine, it is also a veritable gastronomic wonderland with fantastic – and very affordable – beef, game and seafood in abundance. 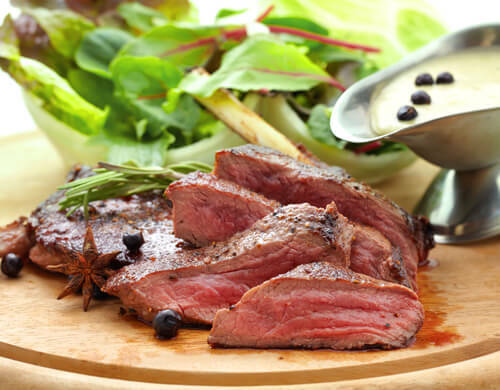 Venison is the meat of deer or antelope and in South Africa, while impala, springbok and kudu might look cute on safari, they also taste great with a nice glass of Pinotage. Venison is lighter, sweeter and more tender than beef and often is served with a sweet berry sauce that really lifts the flavour. When served grilled or barbecued it should be rare or medium-rare to stop it from drying out. It can also be served in stews. A nice medium rare springbok fillet pairs perfectly with a South African favourite, Pinotage. A combination of Cinsault and Pinot Noir, the Pinotage is sometimes referred to as a ‘love it or hate it wine’ but give it a go and you’ll be pleasantly surprised. The elegant Beaumont Pinotage Bot River has notes of red berry fruits and vanilla as well as refreshing acidity that pairs perfectly with the gamey meat. Beaumont has been making wine in the cooler climate of Bot River Valley since 1974 and is certain to convert any cynic. Although it’s a bird, ostrich has no breast meat like chicken or turkey meaning all the meat comes from the leg and is, therefore, a darker meat. Unlike beef, it has little to no fat giving it a lean texture more like lamb. Although the flavours are not quite so rich as other red meats, its high-protein, low-fat content makes it one of the healthiest meats around. Like a beef steak, ostrich steaks are best grilled or fried on a high heat to lock in the moisture and avoid overcooking. Sometimes, ostrich is served raw as a carpaccio. As the flavours are milder, a nice Syrah with strong peppery flavours pairs perfectly with this big bird. Try the Reyneke, Reserve Red from Stellenbosch made entirely from Syrah. With spicy white pepper, lavender and thyme and fine tannins, this biodynamic wine will pair perfectly with your meal. This South African sausage is made from minced beef with spices such as coriander, cloves and nutmeg. Every region will have a different version of the sausage with the exact recipe often a closely guarded secret. 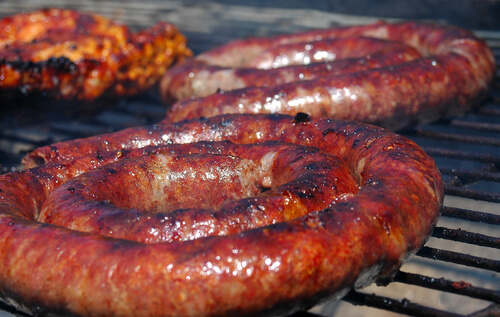 The boerewors – or Farmer’s Sausage – are barbeque staples and sometimes beef mince might be mixed with other meats such as lamb, venison or pork. Although a good beer will help a boerewors slide down, try a dark Cabernet Sauvignon to cut through the fat of the meat. The Edgebaston GS Cabernet Sauvignon from Stellenbosch is dark in colour and has strong blackberry and dark fruit flavours. It has a smokiness which will work well with the barbequed flavour of the sausage and is an affordable and reliable bottle from one of the best wine regions in the country. 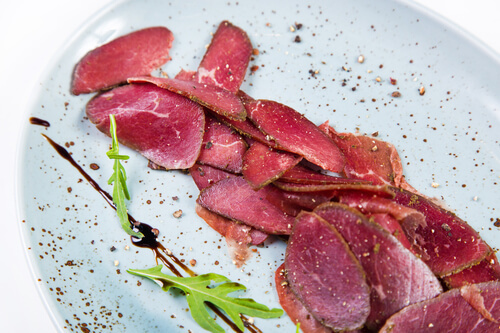 South Africa’s go-to snack is the smoked dried or cured and spiced meat made from beef or venison. 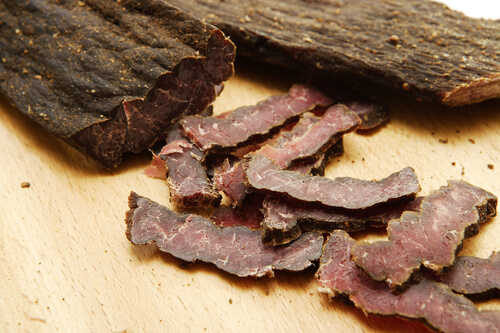 Some biltong is similar to beef jerky whereas some is cut thin and more similar to Spanish jamon iberico. The thickness and type of meat as well the amount and type of spices used, impact the flavour but most will have a smoky, woody taste. The oaky, smoky aroma of a good Shiraz works well with this cured meat. Try the Diemersfontein Shiraz from Wellington which has lots of chewy tannins and charred fruity flavours. 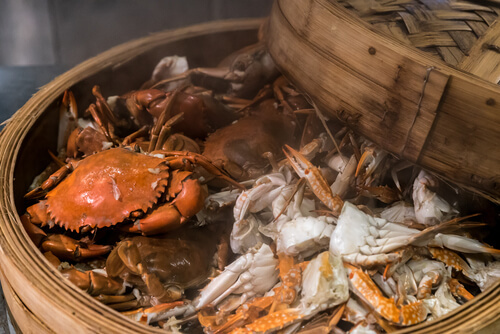 It’s full-bodied and the leathery, smoky aromas match well with the dried meat. 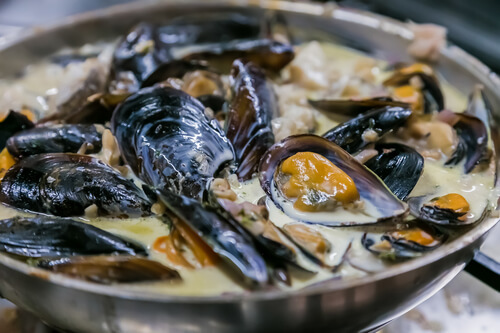 The hundreds of kilometres of South Africa’s southern coastline ensures there is always plenty of seafood available. In some areas along the coast, bokkoms can be found drying by the side of the street. These small, sundried mullet fish are salted and served as a snack similar to a fishy version of biltong. It’s best, however, to go for the abundance of fresh fish and crab that comes off the boat each morning. Chenin Blanc is South Africa’s go-to white wine, and pairs wonderfully with a Steenbrass fillet or a steamed crab. The most widely planted grape in the country has a bright fresh fruity taste with floral characters. The Vondeling Petit Blanc Chenin Blanc from Swartland with light, tropical flavours of pineapple and passion fruit, will work well with shellfish. Nothing is better than watching the sunset with a good glass of wine and a plate of oysters in front of you. Found along much of the south coast, some of the best are found just north of Cape Town at Saldanha Bay, Kynsna, or Wilderness – slap bang in the middle of the coast road. The slimy, salty pockets of heaven can be washed down with a nice sparkling wine but also go well with a fine Sauvignon Blanc. Sauvignon Blanc’s are super dry, crisp and refreshing. 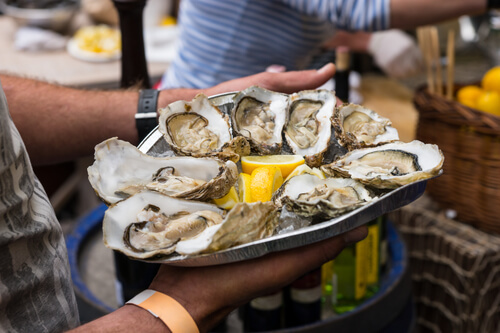 They also have fresh green flavours that work well with fish dishes and oysters and don’t overpower the delicate flavours. Leopards Leap Sauvignon Blanc from the Franschhoek region is a tangy wine with a long finish that makes this an easy and enjoyable drink.